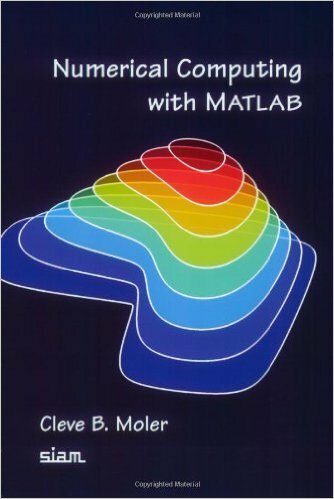 A textbook for an introductory course in numerical methods, MATLAB, and technical computing, with an emphasis on the informed use of mathematical software. Cleve Moler wrote:Reproduction of single copies of this Web edition is permitted for individual use. Reproduction or distribution of multiple copies is not permitted without permission from the author via e-mail at moler(at)mathworks.com. This is a textbook for an introductory course in numerical methods, MATLAB, and technical computing, with an emphasis on the informed use of mathematical software. The presentation helps readers learn enough about the mathematical functions in MATLAB to use them correctly, appreciate their limitations, and modify them appropriately. The book makes extensive use of computer graphics, including interactive graphical expositions of numerical algorithms. It provides more than 70 M-files, which can be downloaded from the book webpage. Many of the numerous exercises involve modifying and extending these programs. The topics covered include an introduction to MATLAB; linear equations; interpolation; zeros and roots; least squares; quadrature; ordinary differential equations; Fourier analysis; random numbers; eigenvalues and singular values; and partial differential equations. Motivating applications include modern problems from cryptography, touch-tone dialing, Google page-ranking, atmospheric science and image processing, as well as classical problems from physics and engineering. Numerical Computing with Matlab is designed for a one-quarter or one-semester course primarily for students in science and engineering, at the advanced undergraduate or beginning graduate level. Prerequisites are calculus, some familiarity with ordinary differential equations and matrices, and some computer programming experience.